Offering a range of facilities including BBQs, Picnic shelters, children's playgrounds, green open space, toilet facilities, walkway and cycleway along the river foreshores. Bankstown City Council, in the last few years has commenced improvement works to the park such as upgrades to toilet facilities and rejuvenation of the Lakes. 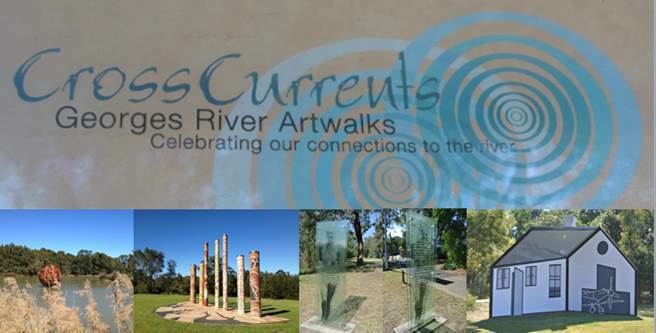 In 2009, The 'Crosscurrents - Georges River Artwalks' Project was launched to commemorate Bankstown's developments from its original Aboriginal inhabitants, early colonial settlement and immigrations to present day being one of Sydney's most culturally diverse communities. The project consists of six artworks representing stories relating to events that occurred along the river's foreshores. 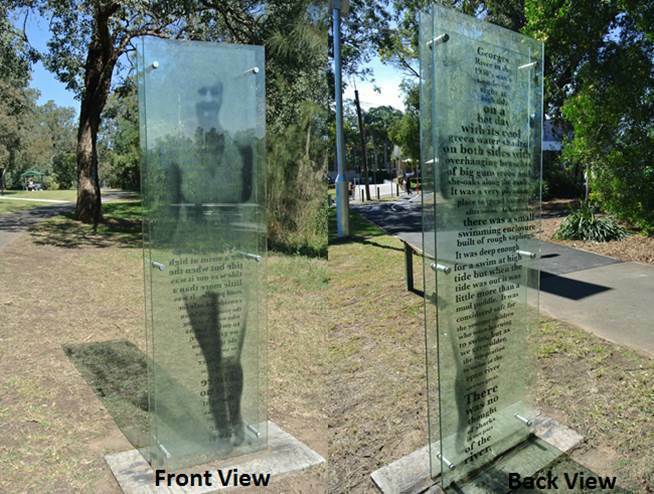 The artworks are placed throughout Mirambeena Regional Park, Kentucky Reserve and Lambeth Reserve to enhance visitors experience along the Georges River and Prospect Creek Foreshore Walkway and Cycleway. The 'Bird Sphere' created by artist Graham Chalcroft is a stunning 3 metre diameter steel sculpture made up of different migratory bird species. It represents the diverse ecology of Shortland Brush Lake and the surrounding areas, which has recorded over 94 bird species. It is also a metaphor for the flow of migrant communities to Bankstown. The 'Seven Peace Keepers' created by artist Jamie Eastwood. The seven pillars represents the local stories about seven brave warriors who travelled The Land to resolve disputes to protect The People against evil spirits. Each warrior spirit had a special ability and when they died they were turned into tall trees, so they could guard The Land forever. The "Rage for Curiosities" created by artist Graham Chalcroft is a kinetic installation using symbols of tools and weapons representing the trade, cultural exchange and struggles between the Aboriginal people and the colonial settlers. Note: Lake Gillawarna is under construction until October 2013. The artwork installation is not available for viewing. "Beryl" created by artist Regina Walter is a glass artwork installation inspired by the infamous shark attack of a 13 year old girl named Beryl Morrin in the 1930's at Kentucky Reserve. The text etched on the glass are words by Beryl's sister-in-law who wrote an inspiring account of this experience. The 'Camoufleur' created by artist Regina Walters is a recreation of a disguised airplane hanger and a 1940's styled home in black and white using amazing camouflage 3D like optical illusions. The artwork represents the Sydney Camouflage Group (artist like Max Dupain and Frank Hinder) who worked at Bankstown Airport during WWII. They were able to showcase camouflage design techniques and ingenious methods to disguise, decoy and deceive the attackers. The 'Celebrations at the Pleasure Ground' consist of a large sandstone and brass installation, commemorating Lambeth Reserve as Pleasure Grounds during the 1900's and the Koh-I-Noor Dance Hall that use to stand at the end of Lambeth St.
On the sandstone outcrops to the right of the sculpture there is a carved image of a person's head dated back to the 1930's. I recommend starting from Shortland Brush then making your way south along Henry Lawson Drive to Lambeth Reserve at Picnic Point. 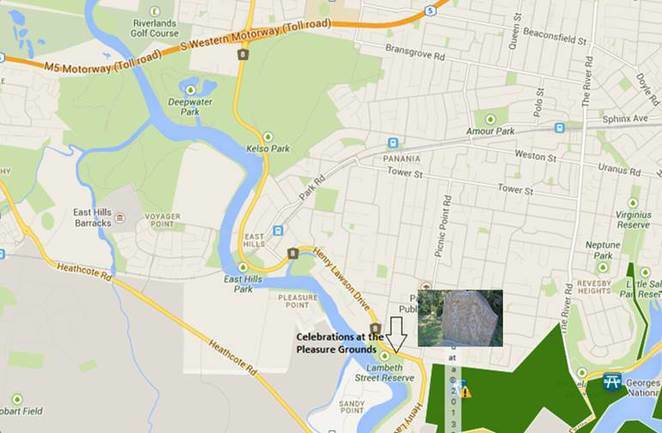 Shortland Brush is located approximately 300m south of the Henry Lawson and Hume Highway intersection. The car park is located off Henry Lawson Drive. Flinders Slopes is a 10-15 minutes brisk walk down from Shortland Brush then another 10-15 minutes brisk walk to Lake Gilawarna/Garrison Point. There are many picnic tables along the river foreshores for you to enjoy a packed picnic lunch. Or you can return to the car and continue south along Henry Lawson Drive turning right at Rabaul Rd to Kentucky Reserve and enjoy a choice of Seafood & Grill restaurant, Café or Thai restaurant by the river foreshore. 'Beryl' is located by the wharf and The 'Camoufleur' is a 10-15 minute brisk walk up towards Milperra Bridge. Return to the car and continue south on Henry Lawson Drive, passing East Hills, look out for the Lambeth Reserve signage, as the road bends to the left you will find the small entrance into the reserve on your right. Follow the windy narrow road down to the car park below. The sculpture is to the right of the car park, opposite the toilets. While you are there, take a stroll along the picturesque Georges River Boardwalk. For more information about the boardwalk, please click on the link. 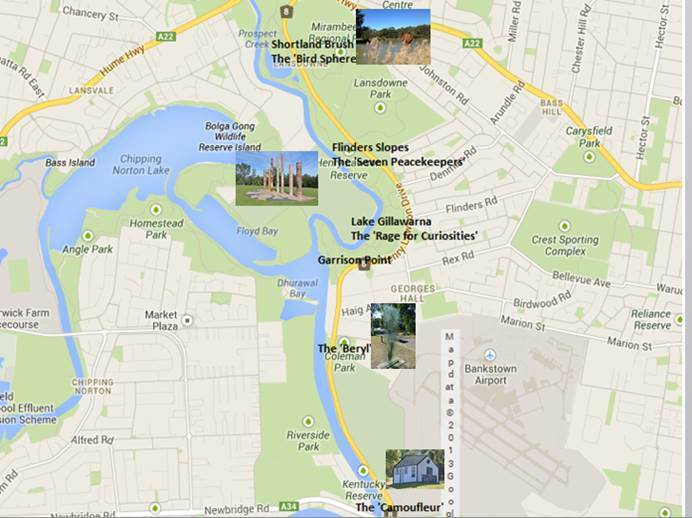 I hope you enjoy the Georges River Artwalks as much as I did. I like The Seven Peacekeepers; it is reminiscent of American Indian art. Ooh I love the big didgeridoo's and that boardwalk is scenic!